Here is my first try with the JK kit. This chassis is made from the .078" kit. It uses a plumber set-up and has the front tires attached to the pans. This picture shows the two alternative body mounting techniques. The floating mounts should give a less tight setup that the fixed mounts. The holes in the front axle uprights have been enlarged on the bottom half to reduce binding during pan movement.The axle is not soldered and the front tires rotate independently. Kit? We don't need no stinking KIT! JK kit here. Very basic. Left the pans intact to get the plumber effect and then I added floating / shaker pin tubes. Should be good for a flat track. Here are the main pieces for my next build which will also be a torsion chassis. Brass is all .032" and an .063" main rail. Pans will be attached to the nose by the .063" wire shown and possible a hinge in the front similar to by previous build on post 22, rear of the pans will be the same. Pans will also be 1.2 grams heavier than the previous set show in post 22. Nose piece will be 2.7 grams heavier. Now where did I put that motor bracket? OK then... here you go... my first chassis in over 20 years!! Took a while to get all the 'bits' you always remember you need... after you come home and get into building!! LOL! I have mainly raced 'wing cars'... and was, as I guess were many here also, a 'gooaAddict'... LOL! I have always been interested in the idea of static and/or floating/isolating weight and general isolation, etc., in chassis and had my mind heading in those directions when I saw a couple of Steube chassis that were doing the same thing and also (apart from many, many Other), was also strangely intrigued by TonyP's 'Aero' chassis. Especially, as I had already started to head in that direction. Hope you don't mind, Tony? ?, LOL!! ...No 'venturis' one this on... YET!! LOL!! But I guess is also a progression of a similar idea. It's funny though,..isn't it,..there is something about the 'Balance' and 'Feel' of a car when you are building it,..they often just feel right!,.. So far,..I am happy with how this build has been going,..I have kind of let the 'Car' lead Me!,.. 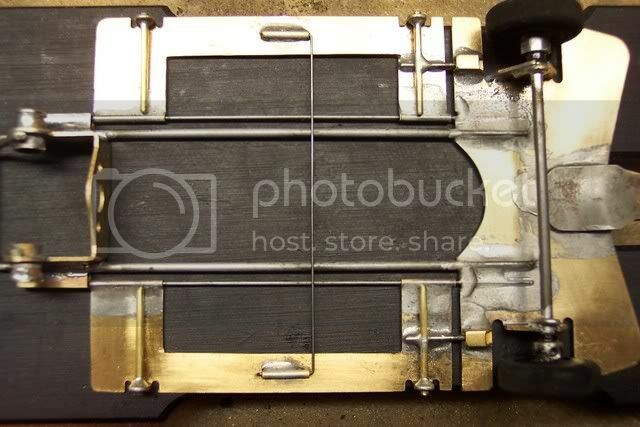 Like Tony's car, I had also started out with a very similar idea at the front and for pans, but was intending to hinge them at the Rear, but at the Moment, have them temporarily attached to an .047 'Spring' (in Effect), located straight through the Motor box. The 'Notched' Rear Pans are Solidly Mounted to the Chassis. It uses one of those 'Chintsy' motor brackets, but it isn't really doing much apart from locating the Motor and giving me a 'Distance' locatorl for the rear axle tubes. The Main Rails ar .063 &.055, with .063 Brass rod 'bits' added and possibly to Be added. As stated above,..I had been thinking of Leaving some weight Low and Hinging the Body,..so at this stage, I have Yet to add the Various Body 'Mounts'/Pseudo Pan Hinges. Although for this First race,..we are trying to Keep it simple,..(In fact Only Hinges for Pans etc,..No Plumbers),..I couldn't Help but try something Just that little bit 'out of the Ordinary' !!,.. As at this stage I am unsure how or what will proive to be the Best method for mounting the body,..I am intending to Try both Rattle type mounts as well as and in Combo with Hinged/hinges. Will post any Future Further positive developments,..hope you like it,..comments, criticisms, suggestions etc all welcome,.,. 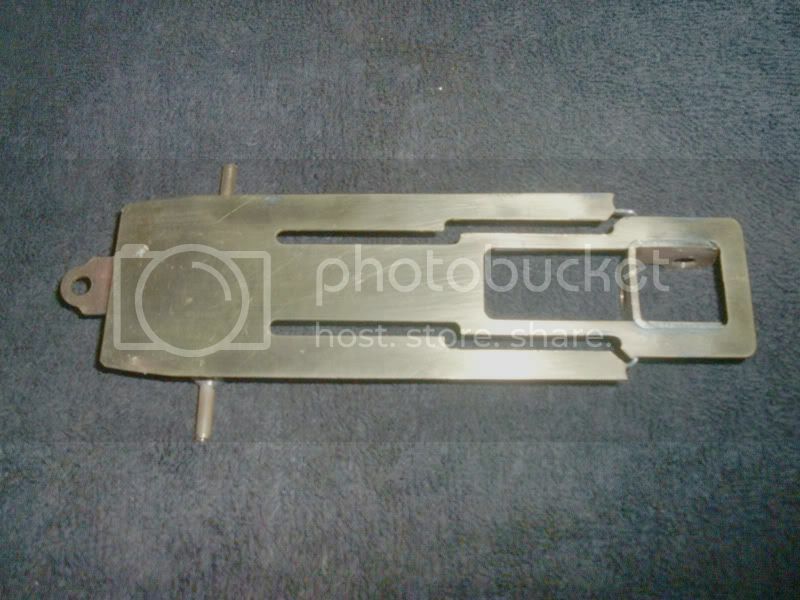 As can be seen from the pics,..I have added Pans made from .020 ,..the Fixed Panlets front and rear are of .032, with the Guide tongue and Centre section of .062, as are the 'Outriggers. The Outriggers, are Hinged at the front, but are 'Sprung and Located' by a piece of .047 wire running across behind the Motor Bracket. Before I got too carried away with the design,..Fox and I went to the track today,..so it has had it's First run and so far,..am Extremely Happy with it's Confident Handling. I have Yet to Fine Tune the "Pans', Movement, but even with Just the 'Spring', it shows Great Promise. !!! ,.. I Was trying for a 'Comfortable' RACE Chassis and so far,..so Good, . It's actually Quite flexible and at this stage would Not seem to require any lead,..but testing will continue. I guess it is a bit longer than Normal, it being 4 9/10ths Guide lead and a 4 1/4 wheel base,..seems OK,.. ,...Practice race on Friday Night,..with Our First D3 race on Saturday evening,..Looking forward to it !!! I bought me one of those "steenkin' kits" by JK and put it together. Believe it or not, those of us that intend on racing in the JK D3 Spec class are going to have to depend on those "steenkin' kits". 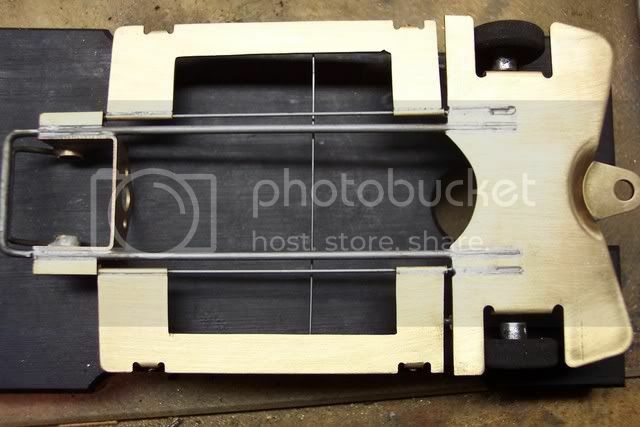 I do have a total scratchbuilt Formula 1 chassis in progress and once USPS decides to get my "BackTack" chassis jig to me, I can finish it off. 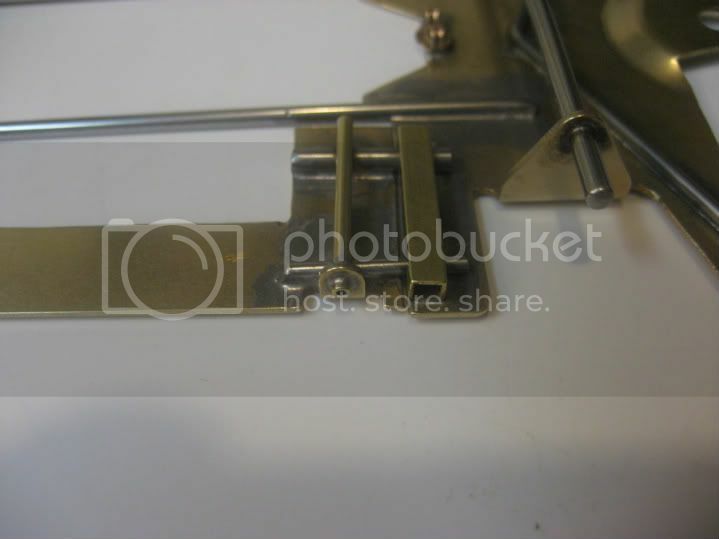 When I first assembled my D3 kit by JK, I decided to use 1/8 inch tubing to construct my hinges from. I set them low on the chassis as should be done and then found out that I could not meet the 3.125 max chassis width spec. I asked about notching the pans, but that was not permitted. I could have gone to 1/16 inch tubing and smaller diameter wire, but I chose another route. 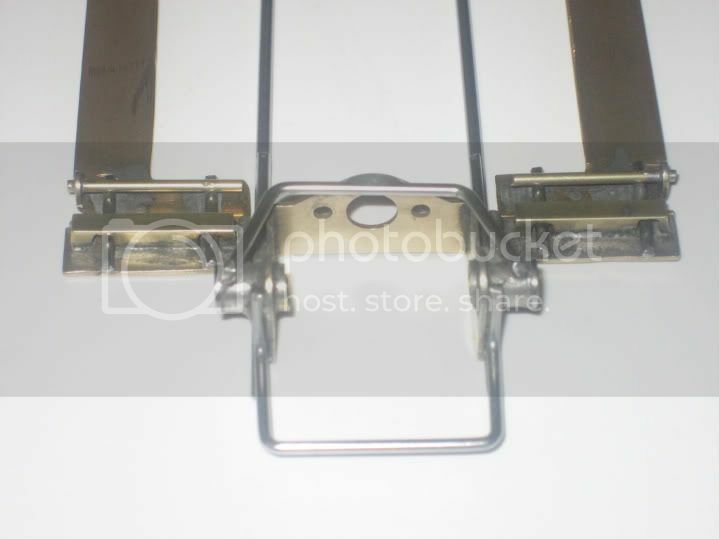 I simply mounted the 1/8 inch tubing on top of the pans, then made the remaining part of the hinge from .035 wire. The spacing seems to work out quite nicely as no shimming is required to get the chassis flat on the jig. I kind of like the way I went. But with the JK kit, I'm sure there will be a lot of variants. Now it's time for a good cleaning to remove all the acid flux and leftover solder and it should be ready to race at the 110 gram weight class as intended. My JK Ti22 body came in this weekend. What a sweet body that is! If it stays nice out today, there will be some time spent in the paint booth! OK well here is the one I started almost two weeks. 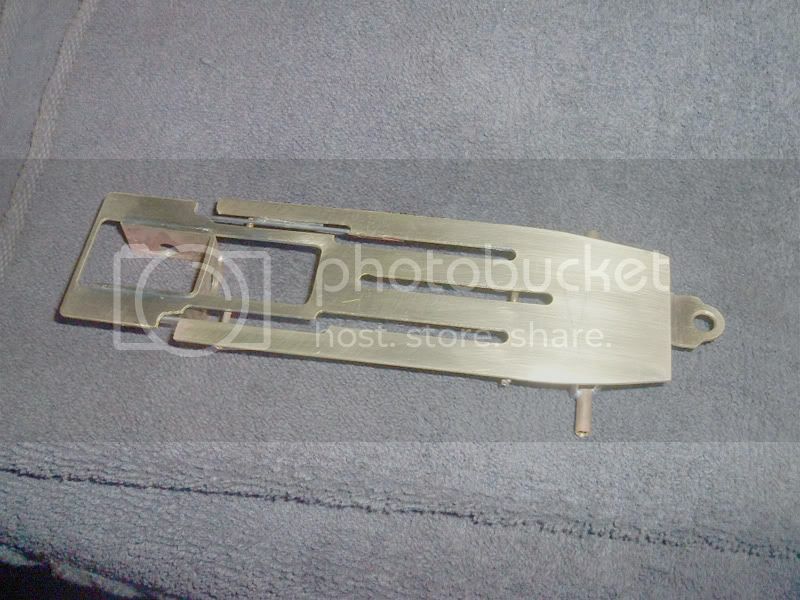 Main rails are .063", brass is .032", and with shaker body mounts. The pans and nose in the front are soldered together is .063" wire and are hinged in the rear. Guide lead is 7/8" and wheelbase is 4.25". The chassis as is weighs in at 50.5 grams so once everything is added it will be about 1-2 grams under the minimum so plenty of room for adjustment. Here are a few pics of a couple recent JK builds. Primarily for a blue King track. 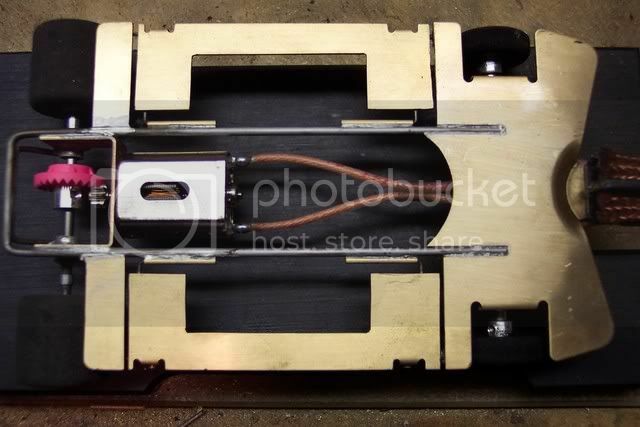 I'm working on an anglewinder chassis, now that the new rules have been established. My starting points are all from the bottom of my spare chassis box. lol One is an old Parma BrassKar (thanks Mr. Hershman for the ID) and the other is some random plumber wing car chassis. Here's hoping this works! 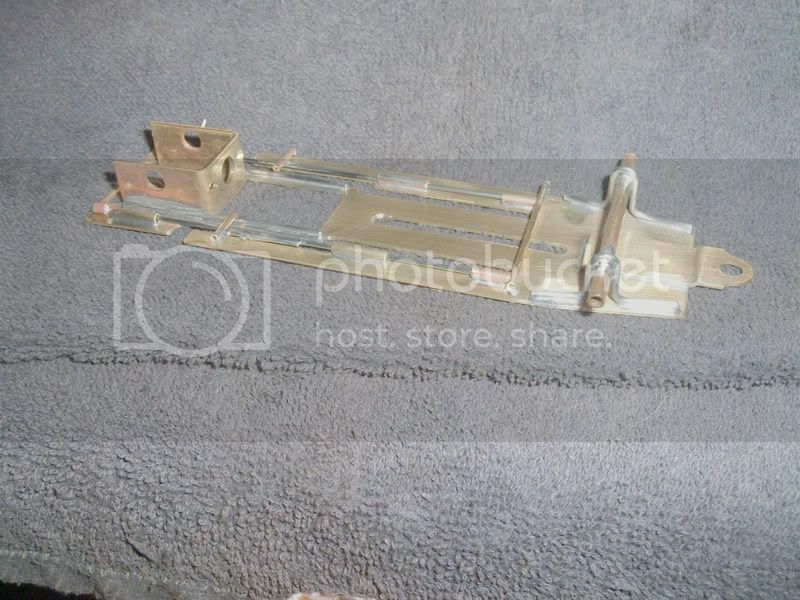 Here are a couple pics of my IRRA stock car chassis. I chose to emulate Tony P's Aero chassis. I used an R-Geo 3/4" rear bracket with .078" mainrails. Hey, those BrassyKar chassis are a great place to start. Lots of good parts and the best part, it's just sitting there! I chose to build mine into a GT Coupe entry. With body, ready to race it weighs 110.2 grams. Watch garage sales and such for 'supplies'! Guys, here's my attempt at an anglewinder, I used some old pans, cleaned them up a little, but they still look a bit dirty. Car weighs 98 grams RTR. New for Mac's next week. Traditional/basic retro, 4-7/8" guide length, double .055" rails, 1" front axle lead. Windowed tongue. Built heavier at 55 grams, torsion bar pans. Please remember that any comments, questions, or discussions regarding the chassis posted to this Chassis Gallery need to be made in the Discussion thread. See post #1. My first attempt at a IRRA retro car flame away, guys. About a year ago, Dennis Samson built me a Can-Am style chassis he dubbed the Tuning Fork. It's plumber style and it worked very well on a King track; especially in the donut. At that time we were playing around with wheelbase lengths and the one he built was a short one at 3-7/8" with just about a 1 inch guide lead. I knew the design worked so I decided it to give it a try myself with a couple of things in mind. First, the longer wheelbase, and second, make it a bit lighter to get to around 105 grams total. This has a 4" wheelbase and 15/16" guidelead. Don't have a tumbler so it was just a wash up on this one. I have been toying with this new design for a couple of weeks and some testing in a remote location. This is one proto-type F1 car that may or may not go into production form. We'll see after the next test. Deciding what type of body mounting system to use. ( shaker or solid) Special offset guide tongue for this build. .032 bass plate. I just finished my first F1 car! It weighs in at 59.3 grams as it sits. 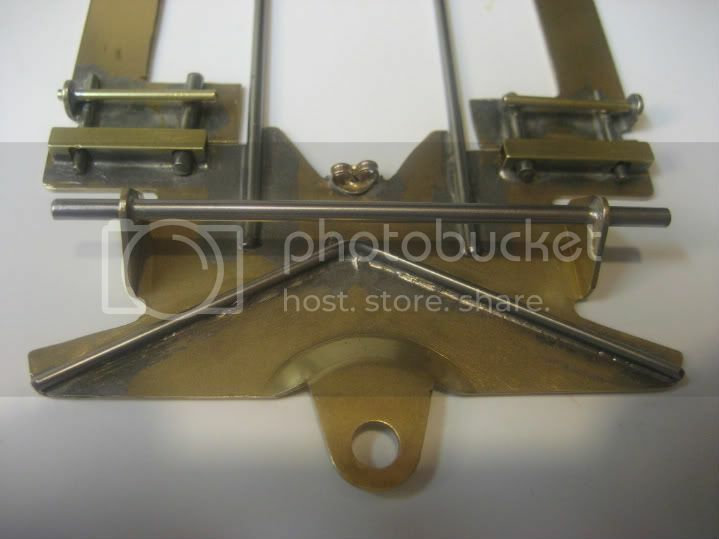 Rails are 1/16 brass rod, pans are 1/16 thick,and tongue and motor box are from R-GEO. The torsion flex car build 1.1. This one with a 3/4 motor long box, for more weight in the rear. "Pans" are floated with a .041 torsion wire thru tubes for limiters. This plate was a little narrow so I kept it for myself. 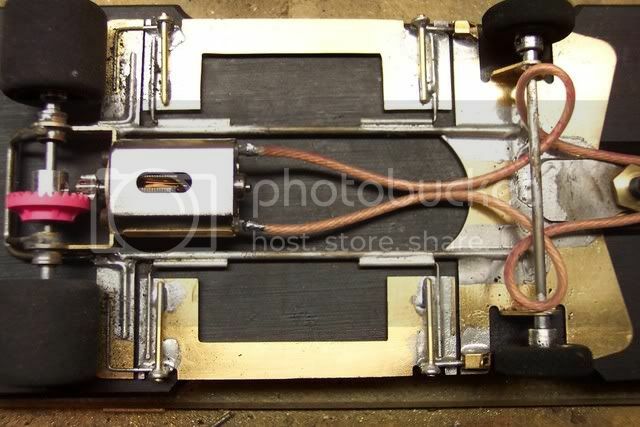 Body is fully floated and independent from chassis base plate. 4" wheel base, 5" guide lead, hypoid, 43.5 grams, should come in built at 95 grams. Oh well... as the first car I built this way has been rather successful... so far!!... 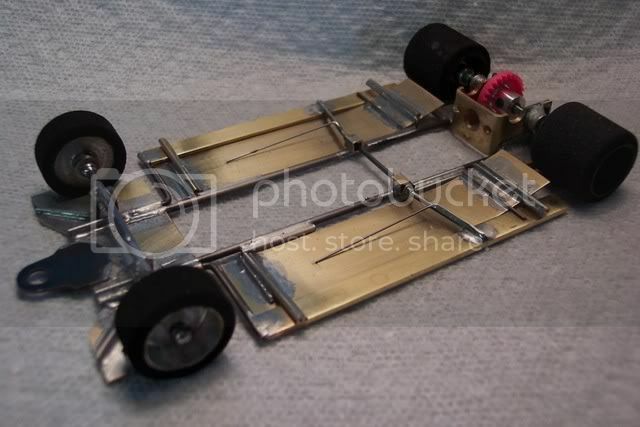 I thought I'd build a version II, with a somewhat more 'body' accomodating 4" wheelbase , the older one was almost 4-1/4". Similar ratio in length to guide from from wheels with a guide lead of 4-7/8". Version I was almost 5". 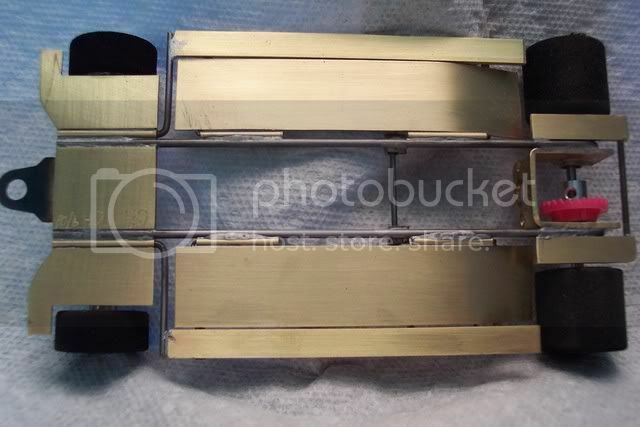 Same rail structure as the last one (1 x .063", 1 x .055", with a bit of 1/16" brass rod in the rear). A couple of 'spare' pans of Rick's, well, what is left of 'em,.. I have the motor a bit closer to the rear axle as well on this one and the pear panlets are .063" as well, which might be a bit heavy (might change them). Haven't weighed it accurately, but it must be close to the last one... say about 120 grams. I must admit, this car argued with me quite a bit during the build... (as can be seen by the odd bit of solder here and there that had the obvious outcome!!... ROFL)... but has ended up 'feeling' OK. Time will tell. Soldering is a bit 'slack' as well... sigh... out of practice as well I guess... ROFL... gotta get a better light for late night builds!!! Have yet to run it, but will give it a run next week at Area 3. 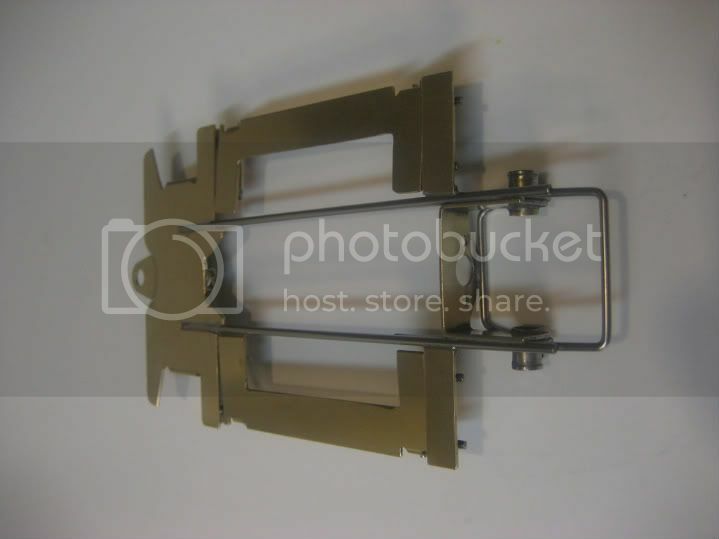 This chassis has square tubing and wires situated on the inide and outside of the pans to simulate floppy action. 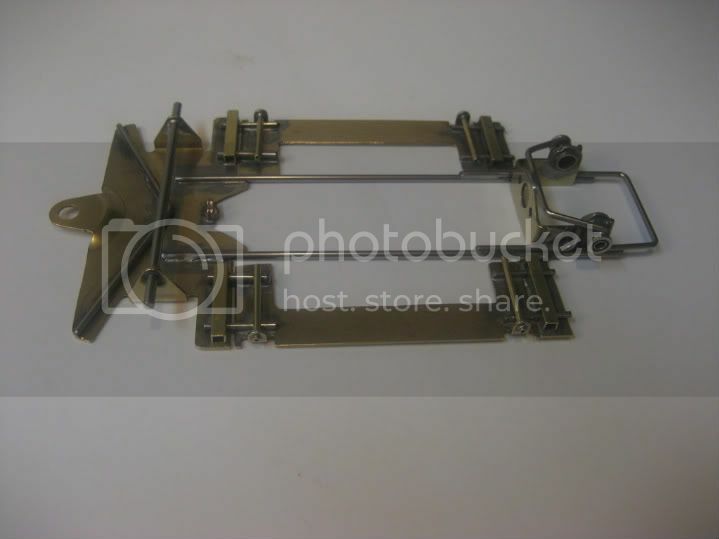 This picture shows the movement limiters, created from 1/8" square tubing and piano wire. This picture shows the wires in the tubing. 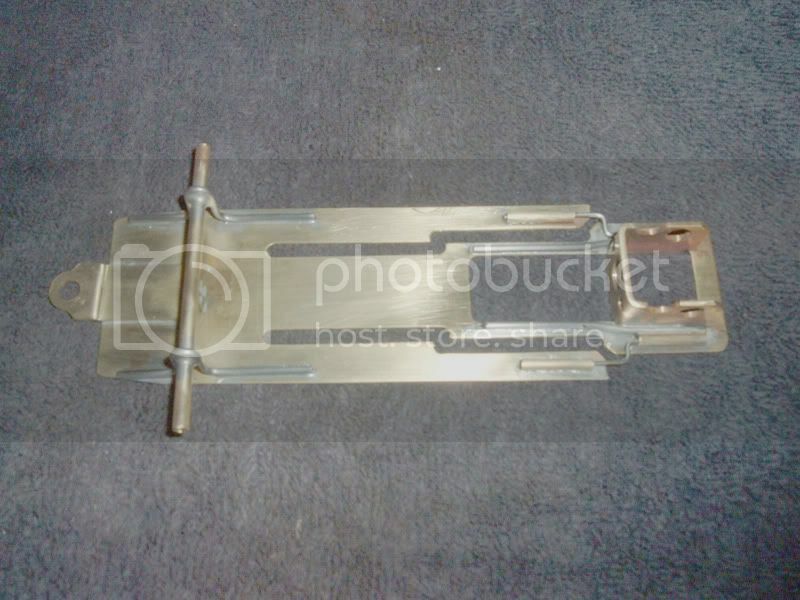 Note that the inside wire is larger than the outside, nearly filling up the opening in the tubing. This aids in the "floppy" movement and prevents reverse floppy movement when downforce is applied to the body. Should this occur, the chassis would drag on the outside. This picture shows the rear chassis movement. Here, all wires are the same diameter. Kind of a different approach to a Retro style chassis build. I built this one as a prototype to see if it would work in limited to no glue of this style of racing. I call it a shuttle for lack of anything better. With the hinge being as far forward as possible giving the car lateral shake as well as up down movement. The chassis actually works quite well and is proven in a couple races here in So. Cal. Car weighs in @ 120 grams. Another shuttle, generation 2 with a concealed hinge for this build. This one may be a little fragile but should be very fast. The weight of this one is 125 grams.